On Sunday 30th April (nearest Sunday to the 25th April) the annual ANZAC Day Commemorative Service was held at The Commonwealth & German War Cemetery Cannock Chase  Staffordshire. It commenced with the march on of the standards lead by the four North Royal British Legion and Royal British Legion Women’s Section County Standards. Despite the weather the Commemorative Service was well attended. Alan Batham former West Midlands Regional Organiser and National Manager of Royal British Legion Clubs read the first reading, and after the short service Last Post and Reveille, were sounded. Representing Her Majesty the Queen, The Lord Lieutenant of Staffordshire, and many local dignataries, Major Ian Finlayson , the Australian High Commission representative and David Symons Commonwealth War Graves Commission Director of United Kingdom Area, laid wreaths while a lone piper played the lament “Flowers of the Forest”. Ken Compton the County Chairman Royal British Legion in North Staffordshire laid a wreath on behalf of the County. Martyn Tighe National Trustee (West Midlands Region) and Bill Parkin National Trustee (for the East Midlands Region elect) were among the guests. About 150 standards from many ex-service and veteran organisations from all over the country as well as The Royal British Legion were paraded . 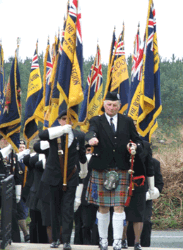 The ANZAC Day Commemorative Service on Cannock Chase is the largest service held outside Australia and New Zealand was organised  by South Staffordshire Royal British Legion. ANZAC Day – 25 April – is probably Australia’s and New Zealand’s most important national occasion . It marks the anniversary of the first major military action fought by Australian and New Zealand forces during the First World War. ANZAC stands for Australian and New Zealand Army Corps.